Aurrie's Chalet is a fantastic getaway for the whole family! 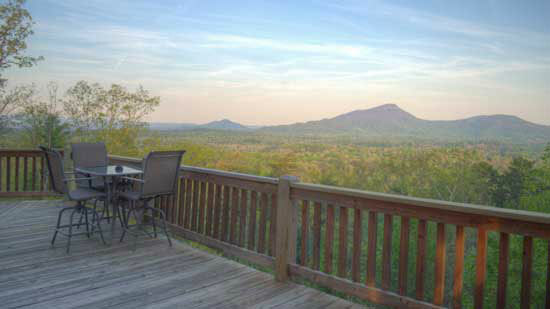 This 4 bedroom mountain chalet sleeps 8 is perched along a mountain ridge perfect for the expanding views of the area. An easy incline road makes it simple to access. 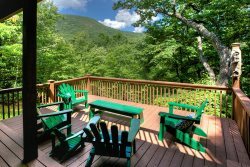 Just minutes from Helen and all the attractions however, you won't want to leave the wrap around decks and plenty of outdoor space to lounge and enjoy the fresh mountain air. Aurrie's Chalet is geared toward the outdoor lovers in your group -- enjoy the outdoor Flat Screen TV, Lava Rock gas fireplace, or build a campfire in the outdoor wood burning firepit! Bring back those childhood memories of S'mores and story telling at Aurrie's Chalet! During the summer months, the trees at Aurrie's Chalet are like umbrellas, situated perfectly for outside coverage and privacy, while the back of the chalet still has those amazing mountain views. Step inside and enjoy the main kitchen area and wood burning stove while watching your favorite game or movies. The King Master is situated on the main floor with a queen bedroom in the loft area, and 2 additional queen bedrooms on the lower area next the living area large enough for the entire group. This chalet style home with extended high ceilings and open space offers a spacious yet cozy feel. Welcome to Aurries's Chalet. Your home away from home! Accessibility: Mixture of paved and gravel roads with gentle inclines. Paved driveway accommodates 4-5 vehicles.